Irish Aberdeen Angus offer Prime Angus heifers and bulls for sale in Laois, Limerick, and throughout Munster, Leinster and the midlands of Ireland. Qualifying for registered purebred pedigree angus with both Irish Angus and Irish Aberdeen Angus Associations. Black and Red Angus. Our main sire, Curragh Malcolm, has been the top rated EBV Angus in Ireland for the last several years. His first daughter to be shown achieved first in class and overall reserve champion in 2010 and continued to win in 2011. In 2012 and 2013 we won 3 rosettes in Ossory and one in the All Ireland. 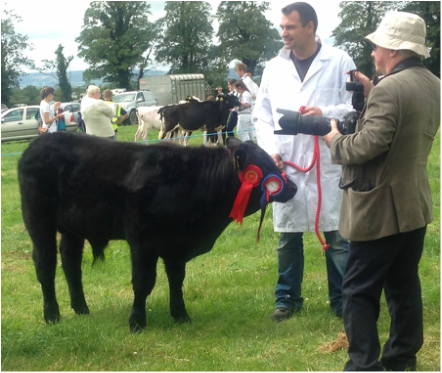 2014 saw his grand daughter, No 970, win the All Ireland Aberdeen-Angus senior heifer. In 2015, a grandson, Dalriada 1366 was Champion at Newcastlewest show. In October 2018 Shane Murphy had a very successful sale of his Mercury herd in Roscrea. Shane had used Dalriada heifers from us, as foundation stock was back when. They sold great. Dalriada Lady Jet 818 was the sale wow at E5.3k. This is great news because it shows that we are at the leading edge of Irish Aberdeen Angus genetics and also that we are disease free. It has taken hard work with a herd of our size. May 2016 The Irish National farm advisory agency, Teagasc, went public with their use of Deep Canyon (AI code ZLL) sons in their model suckler herd. After extensive searches, they bought four Dalriada bulls from us. It was based on purely the factual performance and reliability data available. Click here to see attached pdf from the national farming paper.